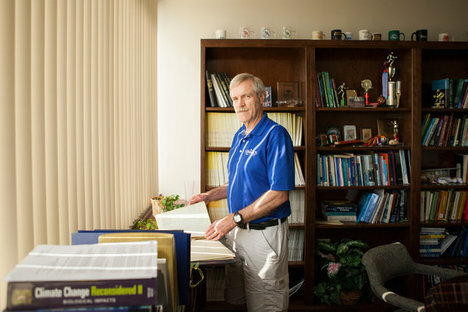 “John Christy, a professor of atmospheric science at the University of Alabama, Huntsville, with the weather data he recorded daily while growing up in Fresno, Calif., in the 1960s.” Source of caption and photo: online version of the NYT article quoted and cited below. Dr. Christy was pointing to a chart comparing seven computer projections of global atmospheric temperatures based on measurements taken by satellites and weather balloons. The projections traced a sharp upward slope; the actual measurements, however, ticked up only slightly. Such charts — there are others, sometimes less dramatic but more or less accepted by the large majority of climate scientists — are the essence of the divide between that group on one side and Dr. Christy and a handful of other respected scientists on the other. “Almost anyone would say the temperature rise seen over the last 35 years is less than the latest round of models suggests should have happened,” said Carl Mears, the senior research scientist at Remote Sensing Systems, a California firm that analyzes satellite climate readings. 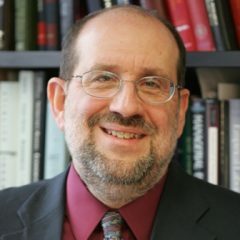 “Where the disagreement comes is that Dr. Christy says the climate models are worthless and that there must be something wrong with the basic model, whereas there are actually a lot of other possibilities,” Dr. Mears said. Among them, he said, are natural variations in the climate and rising trade winds that have helped funnel atmospheric heat into the ocean.
. . . , Dr. Christy argues that reining in carbon emissions is both futile and unnecessary, and that money is better spent adapting to what he says will be moderately higher temperatures.
. . . while his work has been widely published, he has often been vilified by his peers. He says he worries that his climate stances are affecting his chances of publishing future research and winning grants. The largest of them, a four-year Department of Energy stipend to investigate discrepancies between climate models and real-world data, expires in September. MICHAEL WINES. “Though Scorned by Colleagues, a Climate-Change Skeptic Is Unbowed.” The New York Times (Weds., JULY 16, 2014): A14.